We couldn’t resist making a Sew Yummy version of Katy Jones’ Button Quilt (project from Love Patchwork & Quilting – UK). Thanks to Linda Spiridon for her wicked appliqué skills! Monica says her art education came from the Contra Costa County Library and from Mrs. Grufman’s 7th and 8th grade art classes at Foothill Middle School in Walnut Creek, California. As a child Monica loved typeface and logos, and would spend hours in the library looking up books with anything and everything that had typeface and logos. In the mind 90’s when Monica’s brother Marco gifted her with Photoshop (2.0!! ), Monica dove in to her new toy and has never stopped. 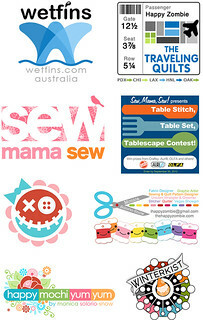 Some of Monica’s most recent work can be seen on Sew, Mama, Sew! as well as on her own website/blog, Happy Zombie. While no longer doing client-side logo work, Monica has shifted her focus to fabric design, and her previous collections were with Lecien Fabrics (Holiday Happy, Happy Mochi Yum Yum and Winterkist). Monica says about her fabric collections, “It’s like the Hair Club For Men… ‘I’m not only the president – I’m a client, too’ “. As for Monica’s self proclaimed addiction to buying fabrics, she claims she’s not a hoarder but rather a curator. Yes, a curator, she insists. 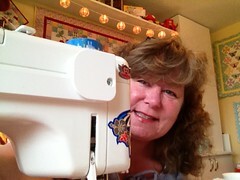 Monica is an avid quilter, embroiderer and maker fabric-ish of things. Many of Monica’s patterns and projects can be found in the pages of Better Homes & Gardens’ Quilts and More, American Patchwork & Quilting (she’s profiled in the October 2011 issue!! ), Make It Yourself, Scrapbooks etc. ; Quilty; Quiltmaker; Studios; various books, calendars, and other publications. 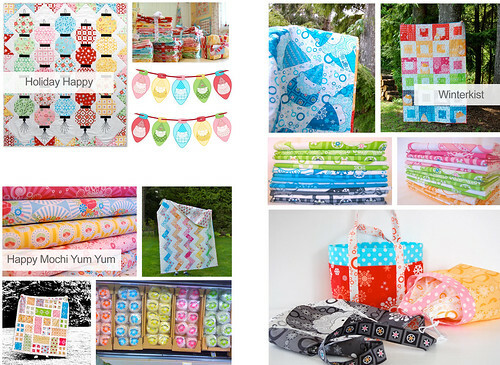 You can see all of Monica’s projects and where she’s in print here and here. 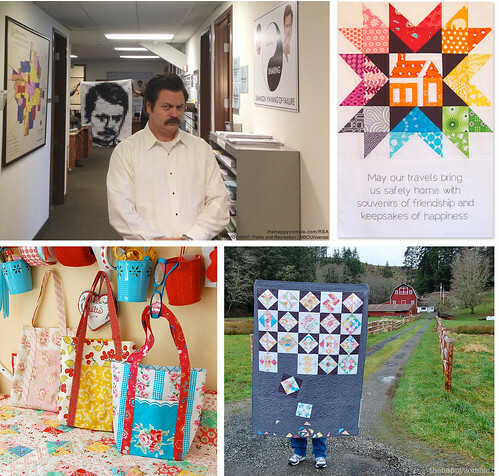 Some of Monica’s most well known projects are her Ron Swanson Along, her version of the Farmer’s Wife quilt, her free Poochi Bag pattern and her participation in the Traveling Quilts Bee. Monica’s says her style is fun, bright, happy with a heaping dash of absurdity – whether it be in fabric design, or illustrations/logs or sewing and quilting projects, and says her style can be summed as, “… so Hello Kitty walks into a tattoo parlor”.